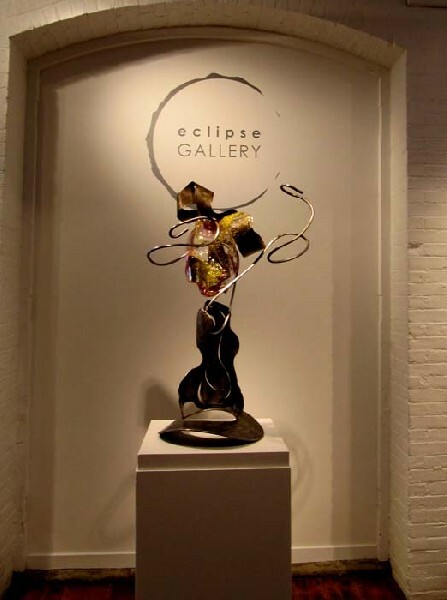 The centerpiece of the Eclipse exhibition. Giuliano photos. Gracefully combining glass with ribbons of steel. Len Poliandro lives and works in Williamstown. 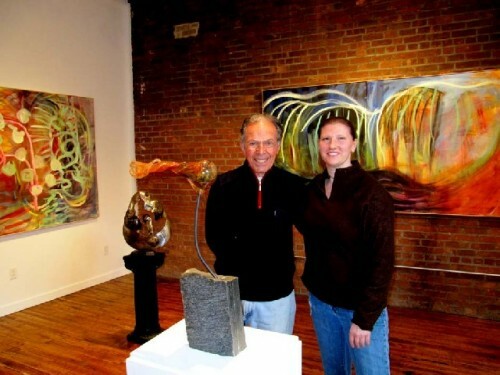 Len with the curator, lighting designer and sculptor, Julie Seitel. 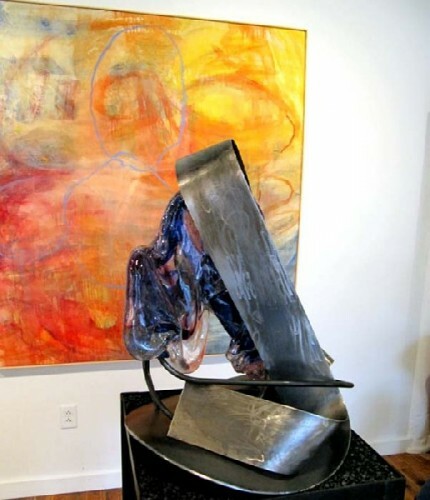 Conflating the sculpture of Poliandro with the abstract paintings of Dawn Nelson. A graceful glass piece stretches out horizontally. Poured glass under a steel arc. 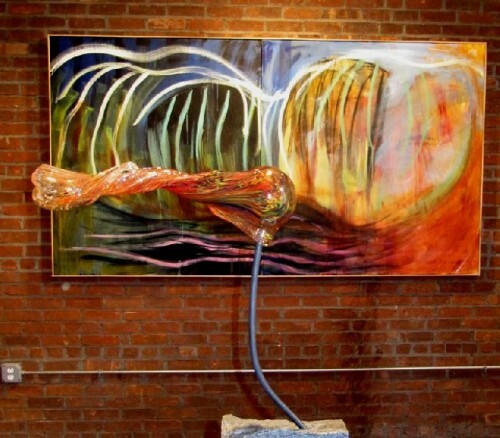 Painting and sculpture creating an abstract dialogue. Working quickly with two ladles of glass increases the madness. 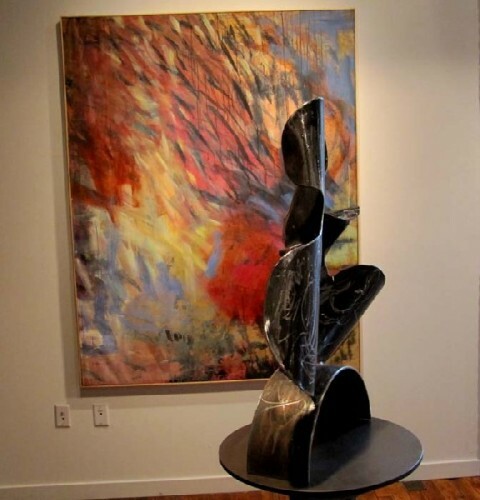 A tall slender, freestanding piece. 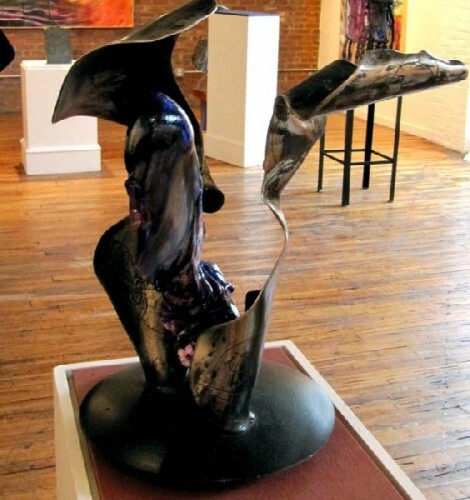 Two years ago Len Poliandro a sculptor from Williamstown showed his work for the first time in the Berkshire Salon, an annual event organized by the Eclipse Mill Gallery in North Adams. 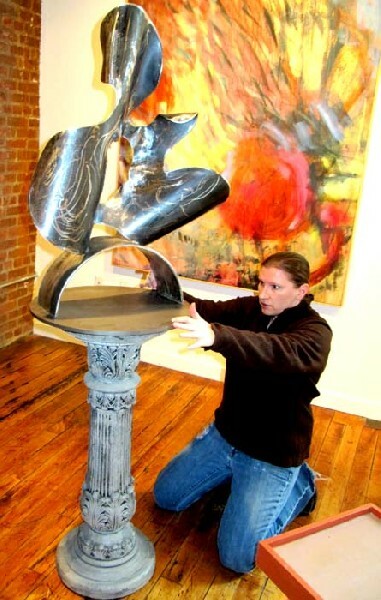 This week he is installing some 17 pieces in a two person show with the abstract painter, Dawn Nelson. 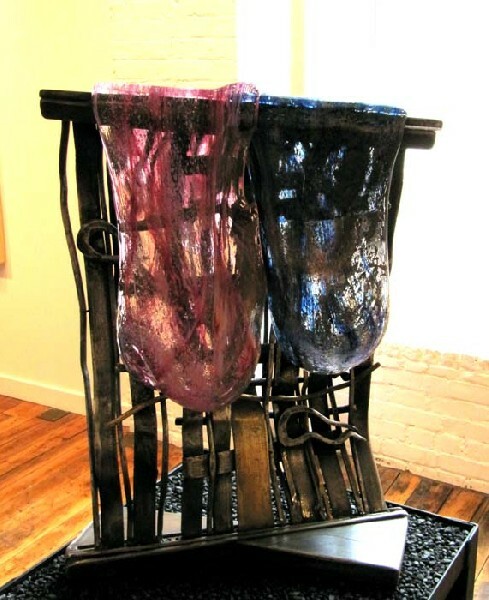 The exhibition is being curated by Julie Seitel, an artist and lighting designer. Julie became interested in the work which she saw in the Salon. Last fall she visited the studio and asked if he would like to have an exhibition. 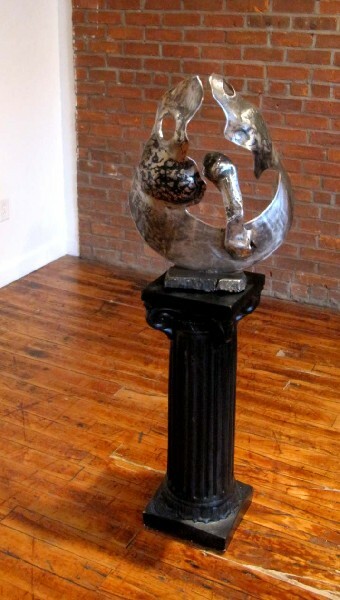 The idea was to show his sculptures on pedestals and paintings on the walls. It would make a perfect setting for the space. The work of one artist enhancing that of another. With a deadline looming and the pressures of showing a large selection of work he was inspired. Indeed, there has been enormous progress since my first visit to the studio some time back. It was what prompted me to urge him to show in the Salon. Until then he had been working to please himself. I told him at the time, the work doesn't belong to you, it belongs to the world. It was gratifying to discuss with him the current project which will be on view from April 16 through mid May. Followed on Memorial Day weekend by the third annual Berkshire Salon. Hopefully we will discover new artists and works. 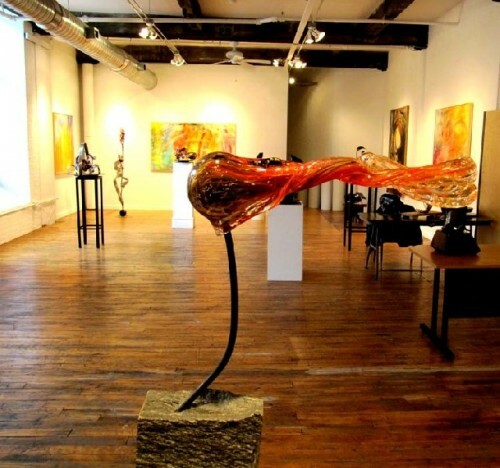 It underscores the manner in which the Eclipse Mill Gallery, which is owned and operated by artists, is an important resource for the Berkshires. The mandate has been to come up with a varied program. There is a focus on Eclipse residents but also a variety of projects that reach out and involve an every expanding community of artists. The gallery has embraced artists on every level from Eclipse residents, professionals in the field, students, to Sunday painters. The most exciting and gratifying aspect of this approach has been discovering emerging artists and challenging work. 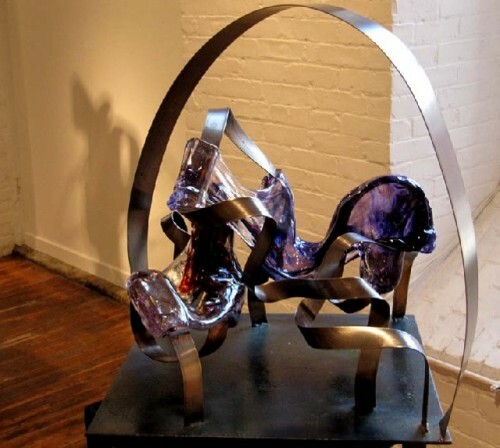 Charles Giuliano Len you work in steel and glass. How did you come to this? Were you looking at work by other artists? 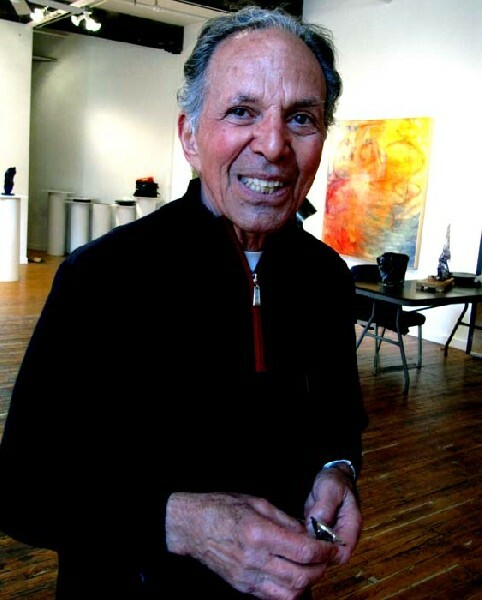 Len Poliandro. There are a few people doing this. 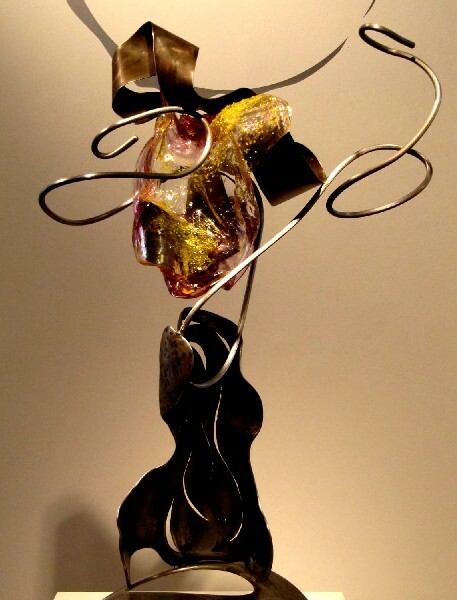 Letting glass flow over metal but nobody I know who is actually using the metal as an armature that can stand on its own. To then cover it with a ladle scoop of molten glass. CG What is the process like? LP Basically I work pretty much going into it intuitively. I put jazz music on and have my mind go with and enjoy the jazz. I like to play Kind of Blue by Miles Davis for example. Then I start to forge and cut the metal and mostly work in a playful mode. From there I start to shape the sculptures. Normally I work on three to four pieces at the same time. There is the freedom of not having a plan to follow or an exact drawing. When I have five to six pieces finished I look at them and how the glass may flow. From my experience I know approximately what will happen. However, glass has its own life and will flow where it wants to flow according to the amount of heat that's in it. So I am part of the process of these two media coming together. But no way do I have control or a menu for it. The work becomes just joy to be part of it and watch it with the fire. CG Once you have made the metal sculpture what happens next? LP I take five or six pieces down to Urban Glass in Brooklyn. It's a foundry for glass artists. I work with three other crew members who have been casting together for15 years. We rent space for a weekend and we all do our pieces. Then put them in an annealor which is like a kiln for ceramic artists. We set the temperature so that it cools very slowly. A few days later, three to four days later, we open the kiln and see what we have. CG If you put the entire sculpture in, the metal with the glass added, that's pretty large. The annealor must be big enough to hold a lot of work, your's and the three or four artists working with you. LP It's about ten feet long and four feet high. You can put in shelves. The artists I am working with mostly are casting not blowing glass. Most of the people at Urban Glass use blowing techniques. So this is about two percent that do any kind of casting. With casting you go into furnace with a ladle and scoop out molten glass. It is about 2,200 degrees. I take out a ladle of molten glass then I add color and mix it up. 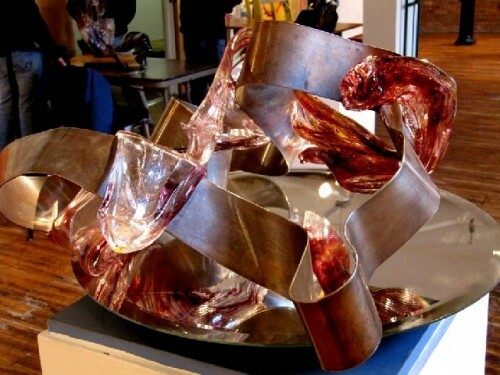 I put the glass onto a metal table then pick it up with ladles and place it on top of the metal sculpture. CG That sound pretty exciting and challenging. LP The idea is to maneuver the glass around the metal. 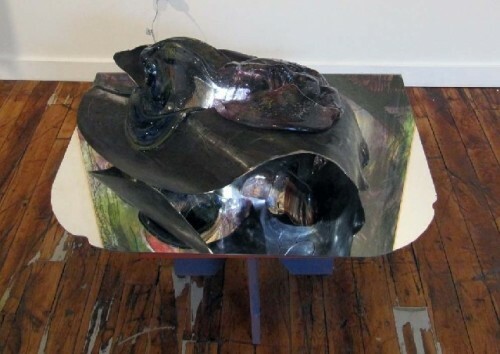 You've got two minutes to get glass out of furnace, add color, place it on the table, pick it up and move it around. In two minutes the temperature goes from 2000 down to 1600 degrees. The glass will stop its movement then you must put it away immediately. If it cools too fast it will splatter. It continues to cool down in the annealor. Blown glass is very thin. You can put it away and take it out ten hours later. Sculpture needs a lot of time because it's so massive. CG Two minutes is not a lot of time. LP. That's why I enjoy this style of working. There is very little control you can't go back and tweak it. So there must be total acceptance of the result and a high degree of danger cause of the molten glass and fire. You have to be attentive and focused. CG What kind of protection and precautions are involved? LP We have special glasses, insulating shoulder vests, and gloves. But you feel the heat all the time. This team we've been dancing together for a long time and we know the choreography of each other at all times. There is a rhythm and trust that is just beautiful. I am amazed at the feeling and movement of this process. It starts with making the metal armature using fire and forging. Metal is turned a white orange at 2000 degrees. I do this in my studio. It is important that you have more control. You can put it back in the forge and take it out. You can give it another heat. CG How did you come to make sculptures? CG How did you take the time off from your business? Were you retired? LP I was retired we were interested in architecture and joined Taliesen. As a part of our fellowship we were required to make an object or to design something with drawings an architectural project. I decided to do a roof design. I shrunk the design down and it became a lamp. In doing this we had a show in front of the University of Arizona faculty and other architects. I was terrified to show my roof design but to my surprise I was given a gift. Because of angles of the shape of the design one bulb was reflected in a manner that it seemed like three bulbs. Everybody was surprised and amazed at this. So I realized that something has happened. I knew that the genie was out of the bottle because of this gift. I had gone into a place that was very deep for me. The genie said I'm not going back in the bottle. I became an acknowledged artist I realized I had this gift and I wanted to do it. LP I realized that I had been an artist all my life Since I got out of grad school at the University of Hawaii. I studied international management at the East West Center. After that I went into my own business designing fabric which I did for 24 years. I used to study markets anticipating trends and then got weavers to make light weight goods and then I would go out and buy paintings to print on the fabric. Ling because a great asset because she has a wonderful sense of color. I never considered myself an artist. I was an entrepreneur preparing a product for the marker and selling it. So when I made this piece, for the first time, I was able to make an object. I was delighted by it. Not because of how it came out but because I got in touch with my deeper self. CG Let's talk about this show at the Eclipse Gallery. What does it mean to you? LP This is my first total exhibition what it means is the stage I'm in as an artist. There are about 18 pieces. I've previously shown at the Eclipse Mill in the Berkshire Salon. That was my first show. 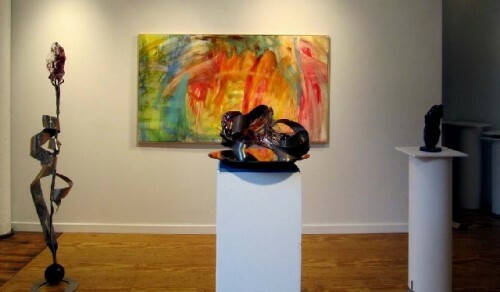 When Harrison Gallery first opened I showed two pieces. She was brand new and I was brand new. During the Eclipse Berkshire Salon people called me and wanted to know what I was doing. Showing in the Salon was the first time I got to show on a scale with other artists. I was be able to see my work in the context of the energy of other artists. Some with different skill levels and I felt I qualify. I'm on a level with other artists in this show. Some of them are from the Mill and some were not. What was more important was that for the month it was open the comments I got. The questions and the feedback showed me that I'm at the stage that I want to communicate my art with others. You were the one who came over to the house and saw the pieces. You said this has to be seen by others. I heard you, and knew you were right, but didn't know if I was ready. That's exactly what happened. It's true and I knew you were right. Particularly your comment the work doesn't belong to you. I believe in that and it's why I never sign my pieces. You meant that this is not you. It is a spirit that has taken a form that now belongs to the world. Because of that I want to communicate. When I was approached by Julie (Seitel) she came and said I saw your piece at the Salon. What else are you doing? Can I see? She came over to the studio and then after seeing some of the pieces she said how about a show? I almost fell down. That was last fall. CG When you made the commitment to have the show how did that impact the work? LP Having this show helped me to focus. I got together the most dramatic pieces and instead of making similar work I pushed the boundary. In terms of scale, the ambition was there. The method. How the glass flows using two ladles of color at the same time with just two minutes. It takes more work and you have to be twice as fast. It's more madness. True. More madness. It means, no you can't do that. Oh yes I can. CG That sounds very challenging. LP. I want to get back to a question you asked in the beginning. Why metal and glass? I'm fascinated with the paradox. The yin and yang of opposites. The metal is substantial and structural. The glass is glowing and brittle. The color and light pierces it. There is a perfect relationship. My work deals with relationships. The yang of the metal and yin of the glass. When it works it's beautiful. Sometimes it breaks and chips. It's exciting but doesn't always work. That relationship was just not meant to be. It's about why I became an artist. I feel when I am doing a piece the energy and force is coming through me but I'm not the doer. The energy is using my hands. There is the excitement and adventure but I am not the doer. That is the key signature of the work. Allowing it to happen. There is no ego in this work. But it is nice when it looks good. "Are you the Len Poliandro that worked and played in Hawaii back in the 1950s and 1960s? I was working with my dad at Lauhala Sportswear." "Oh Len, We are so pleased that others will know the joy of your work. Want to add our piece to the exhibit?? See you Friday night. Love, Judy and Bruce"